A Spotter is best described as a qualified expert whos responsibility it is to ensure a job is done in the safest manner possible to avoid injury warning others of any unsafe approaches to a job or project. If you are required to hire a spotter, the contractor that requires a licensed spotter must meet strict Electrical Spotter Requirements. These include ensuring they are properly inducted into all site safety procedures including the relevant Safe Work Method Statement (SWMS). The spotter must remain at the task for the entire time the plant machinery is required to operate in accordance with the SWMS. The spotter may only observe for one item of plant machinery at any time. The spotter must also carefully position themselves so they can monitor the distance between the equipment and the power lines and must provide early and effective warning to the equipment operator of any potential encroachment on the No Go Zone. If you have planned works to be conducted near powerlines you may want to familiarise yourself with the requirements of when an electrical spotter is required according to Energy Safe Victoria. For any works that are outside of 6.4 metres from an overhead power line there are no specific requirements needed to have a licenced spotter. If you are required to work between 3 metres and 6.4 metres from an overhead power line then you will need a registered spotter as this is known as a Spotter Zone. For any works conducted within 3 metres or less from an overhead powerline you will be required permission/permit from the relevant power network operator to work in that range of the power lines. 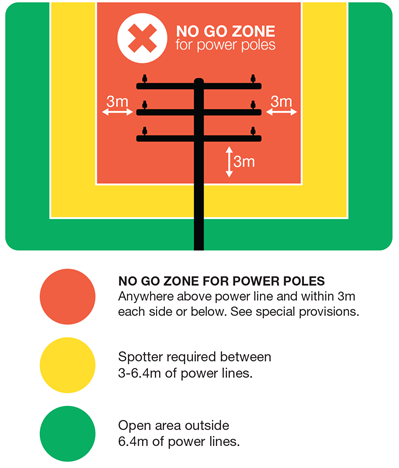 If you have planned works to be conducted near tower power lines outside of 10 metres no specific requirements are needed for a spotter, any works between 10 metres and 8 metres a registered spotter is required – this is known as the spotter zone. For any works conducted within 8 metres from a tower power line permission/permit is needed from the relevant power network operator.